Juice So Good, makers of Coffee So Good, and Bliss Gourmet are providing product for an Instagram giveaway mentioned in this post. Both are local products I purchase myself and my family and I love! Minnesota Love Week continues! As I mentioned on Monday I’m sharing the love for some of my favorite local Minnesota brands with a week, yes a whole week, of giveaways on Instagram! If you are a regular reader or follow me on social media you know I love my coffee. Mixing it in a smoothie bowl is not uncommon either and I’m loving mixing coffee with a banana, and a few other things as you may have seen on Instagram Stories, before barre or even a smoothie bowl. 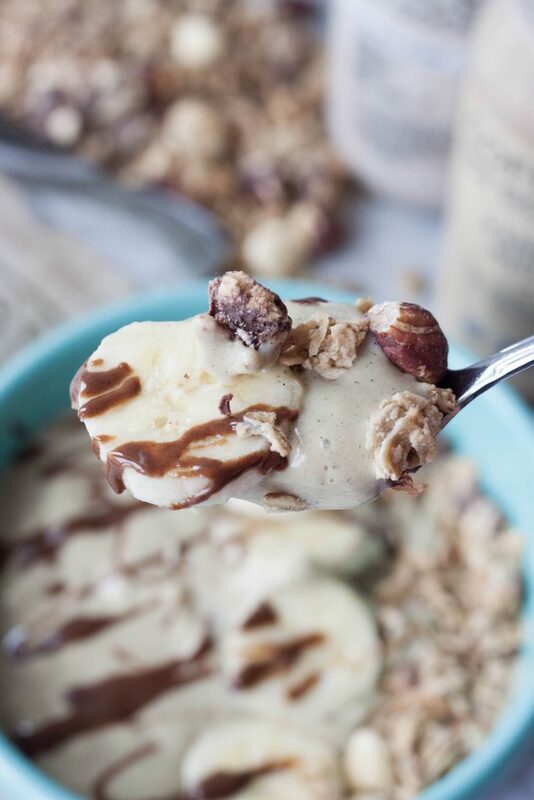 Of course I have a non coffee version that tastes like dessert but is good for you in these Banana Cream and Nana Latte Chocolate Hazelnut Smoothie Bowls! Coffee So Good is a local favorite bottled coffee on the go and is a staple for me. The good news is Coffee So Good is now available in so many Target stores and in the smaller bottle that is perfect and makes a great dairy free, vegan, grab and go coffee option. They are also organic, non-GMO, contain no additives or preservatives, are made with cold press real coffee that’s less acidic, and are packed with the protein and rich creaminess of raw cashews! Making for an indulging, yet healthy, coffee that’s better than what you’ll find at coffee shops. While I’m happy that coffee shops now have dairy free options other then soy they aren’t the best options as they are loaded with sugar and are usually too sweet for me and lacking that creamy texture. Coffee So Good is organic and a creamy delicious coffee drink that is guilt free. It just so happens that they are also the makers of my favorite juices. Blending one of my favorite Coffee So Good drinks with frozen bananas makes an indulging smoothie bowl that’s perfect for breakfast post barre. Adding in my favorite plant-based protein Vega is perfect post barre. For the girls, a dessert, or treat, I use Juice So Good Cashew Bliss which is an indulging cashew beverage that’s so rich and creamy and a quick substitute for homemade cashew milk when you’re short on time or for on the go. 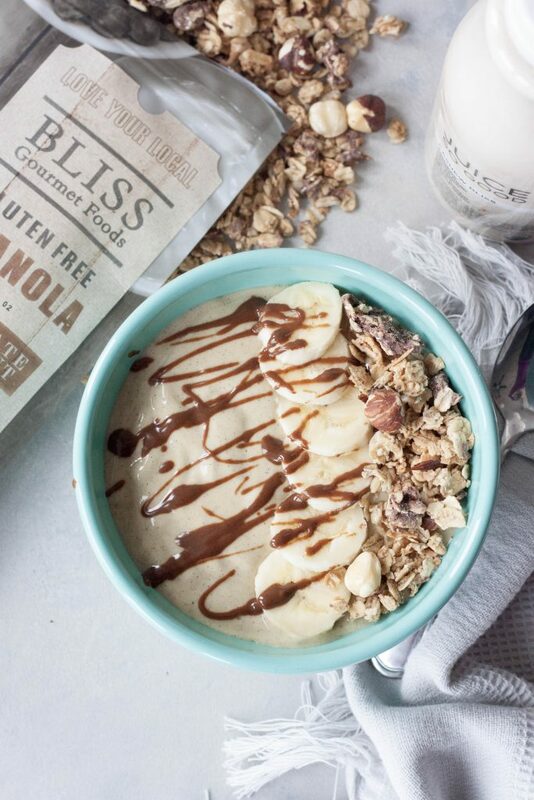 Top this delicious smoothie bowl with fresh bananas, hazelnut spread, we use a sprouted Jem Organics Hazelnut Spread or Peanut Butter & Co Chocmeister Dark Chocolatey Hazelnut Spread (less sugar, more protein), and local Bliss Chocolate Hazelnut Granola and you have a real treat! We use to make homemade granola all the time, even having a new monthly flavor to add in to what we make fresh weekly. We don’t make granola much anymore as we don’t consume it as much as we use to but like to have it around for parfaits and to top our smoothie bowls. 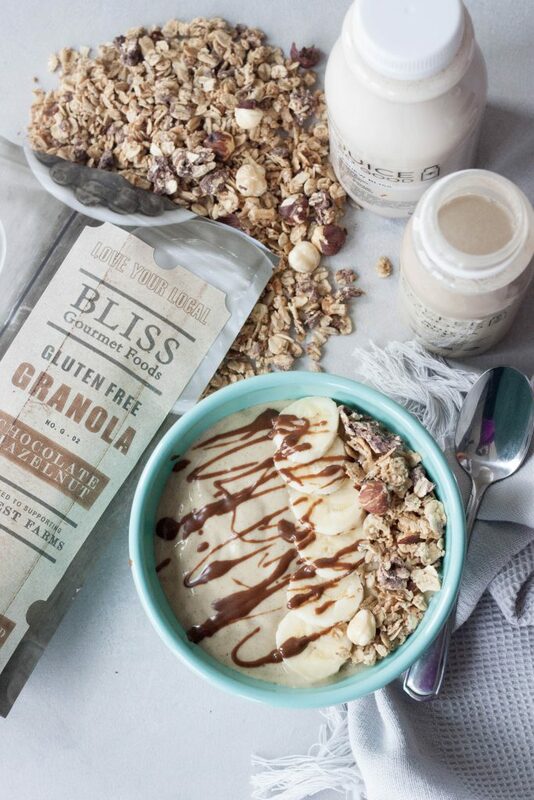 We recently found local Bliss Granola that is made with quality gluten free ingredients and sweetened with maple syrup. Our favorite Chocolate Hazelnut is made with Minnesota organic oats, hazelnuts, olive oil, Minnesota maple syrup, coconut, organic sunflower seeds and sesame seeds, brown sugar, sea salt, and (dairy free) dark chocolate. Their granola is made by hand and they are committed to supporting local famers. You really can’t go wrong with this simple delicious combo for breakfast, post workout, or a snack, it really leaves me speechless! It’s a reminder to enjoy the simple things. *Thicker milk, such as homemade especially if not using protein powder. If not using protein powder you will also need more than 1 banana. *Or 3/4 cup of vanilla coconut milk, or thicker vanilla homemade nut milk, and 1/4c cold brew or 2 shots cooled espresso. If not using protein powder you will also need more than 1 banana. Notes: I also add in collagen and or gelatinized maca as these are things I often add to my smoothie. These are the only things I’ve added to this smoothie bowl as I don’t want to alter the simple indulging simple flavor of it. In a Vitamix, or high-speed blender, blend together milk and or coffee, optional protein powder, and 1 frozen banana until smooth. Adding in more banana and using the tamper tool until you reach desired consistency. Pour into a bowl and top with granola and hazelnut spread. Enjoy! Banana and hazelnuts a winning combo for sure! 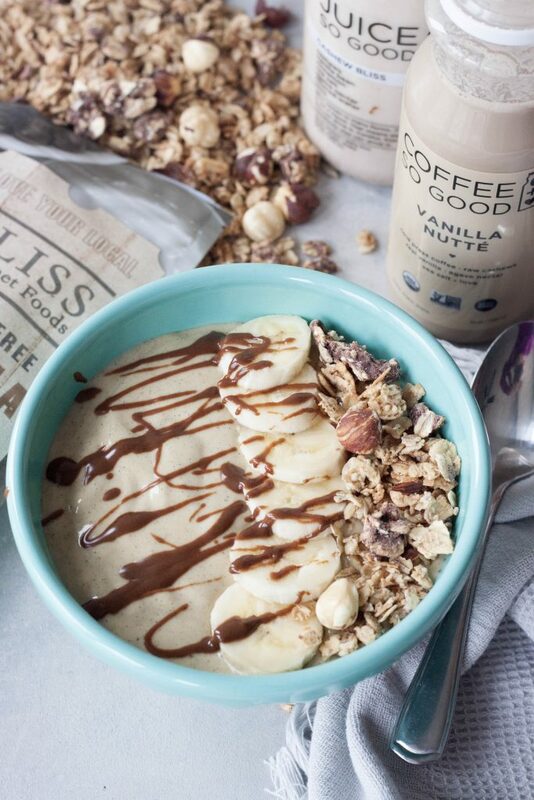 I really need to try making a coffee smoothie bowl! 😛 This looks so awesome, and yay for supporting local brands! :] This looks amazing!